[Updated] A serious collision occurred this morning [June 27] in Pembroke, involving a car and a motorcycle. A police spokesperson said, “Police and first responders attended a report of a Road Traffic Collision that took place around 10:35am today [Wednesday] on St.Johns Road in Pembroke. 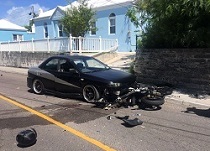 The police said it appears that a male on a motorcycle was traveling west on St John’s Road when he collided with a car traveling in the opposite direction. “As a result the man was taken via ambulance to KEMH where his condition is classified as extremely critical,” the police said. Further information is limited at this time, however we will update as able. Update 12.14pm: Police Media Manager Dwayne Caines said, “The Bermuda Police Service can confirm the death of a 59-year-old man who died as a result of Road Traffic Collision that took place on St. John’s Road in the area of Gorhams at 10:35am. “Upon police arrival, it was ascertained that the 59-year-old male was traveling west on St. Johns’ Road when he lost control of his motorcycle and collided with a car traveling in the opposite direction.